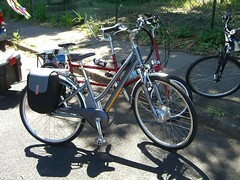 Last weekend we bought a new bike for Meta, the Giant Twist DX. 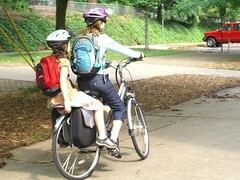 She will use it to commute to and from school down in Sacramento. The distance from our rental to the school will be a little over 3 miles on the American River Trail. 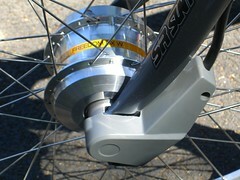 To make the commute easier (particularly in the Sacramento heat) the Twist DX features a “hybrid” electric drive. It kicks in when you are pedaling helping you get up to speed or pulling you up hills. 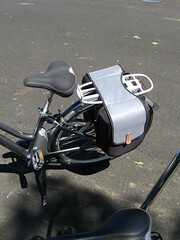 The motor is on the front hub, batteries hidden in the back panniers. 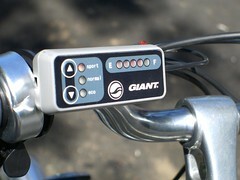 The control and battery indicator are on the handlebars. The harder you push on the pedals, the faster it goes (up to 15 mph). It only needs one battery to run, so the other can be removed for charging (and to reduce the weight). It does NOT have regenerative braking. 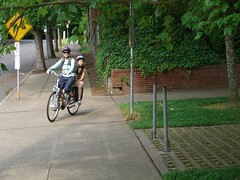 The ride of the bike is very smooth and gives Meta an extra amount of confidence in traffic. 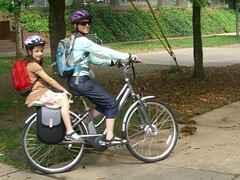 And we can still use it on the bike paths in Sacramento because it is just a bike (with a little extra kick). We purchased the bike at the local dealer, Bike n Hike. They only have a total of 16 of these for Portland in the first shipment, although there will be more later in the fall. I think it will be a popular commuter bike. And two more down on the Portland City Council. I voted Jim Middaugh who was beaten soundly by Nick Fish and I voted Chris Smith who came in last for his seat (Amanda Fritz won). Big bummer on both of those. At least Randy Leonard won his seat back. Oh, yeah, I voted for someone for the Presidential candidate for the DNC. I don’t really care how that turned out. 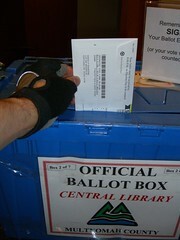 Overall a pretty poor day at the polls for me. I know I should look at all the aspects of a politician’s platform to decide how I should vote, but the fact is that Sam Adams is a major proponent of biking and Sho Dozono is not: BikePortland.org » Blog Archive » Sam, Sho and the race for mayor. That alone will get my vote for Sam. Sorry, Sho, it’s reason enough for me. Portland is setting an example of sustainability for the country and we need a mayor that recognizes that. Bikes are not the only issue, but they are certainly a bellweather in this town.